“This is the first part in a series of blog articles that Stepping Between Games have kindly agreed to host. I’ll be focusing on each of my Warhammer and Warhammer 40K armies in turn, discussing the development of the miniature ranges for them and the modifications I’ve made to my miniatures. This series of articles will cover the following WH40K armies: Eldar, Imperial Guard, Tyranids, Genestealer Cult, Blood Angels and Chaos Space Marines. It will also cover the following Warhammer Fantasy Battle armies: Bretonnians, Tomb Kings, Vampire Counts and Empire. 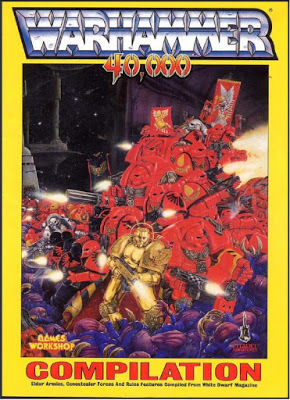 My interest in Warhammer began when my close friend James Holland first got Space Hulk back in 1990. Our games had to adapt for three or four players, so we got used to amending the rules and working out how to accommodate different characters. Space Crusade provided a variety of other characters we could encounter on different derelict spaceships. The first army I began collecting was Eldar back in 1990/1991 when I was at Secondary School. Back then, I used to get £2.00 pocket money a week and decided to be quiet about the payments my parents had missed for a while, before providing them with an accounting of around forty-five weeks that they’d missed. 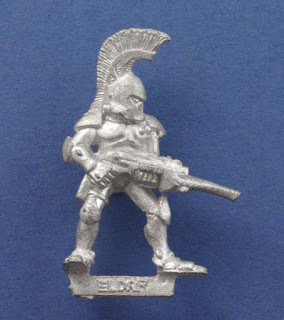 At the time, lead miniatures were sold by Games Workshop for £2.99 for 5 (with a few exceptions) and prices were about to rise to £3.99 for 4. My order was placed literally, the day before the price rise came in. To this day, I still use “£1 a miniature” as a guide for my purchases on Ebay. Most of what I pick up is plastic rather than white metal or lead, but the detail has massively improved over time. The rules for Eldar came out in a White Dwarf that I missed out on, but one of my friends picked up the Warhammer Compilation, a yellow book with the original Eldar army list in it. This book was a massive source of inspiration to me. 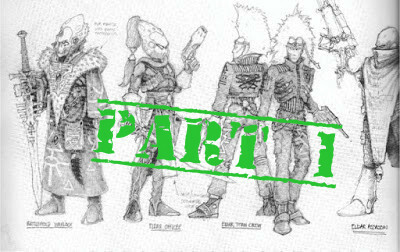 It featured articles on the Eldar, on Genestealer cult armies, Space Marine armour variants, and lots more. The Eldar lore in this edition was better than most of the lore in the next two dedicated codices. The randomised charts that asked players to roll up the stats of their Avatars and Exarchs were probably a wrong move, particularly for teenage wargamers desperate to get an edge. One of the force organisation rules at the time was that you had to take an equal number of Guardians to Battle Guardians, which immediate meant all the extra squads I’d bought couldn’t be used. Most of my first miniatures were leads from Games Workshop’s “Space Elf” range from 1987. You can see most of the figures here. I’d bought all these figures without much of an idea of how to paint them. I’d painted plastic toy soldiers before, but my Humbrol enamel paints had all dried up. I couldn’t afford the Games Workshop paint packs, so I bought a few acrylics from the local art shop. They were a bit thick and the shop didn’t have a metallic colour, so I decided to use grey for the ‘chainmail’ (mesh armour) and orange for the plates, in a Saim Hann style. My first batches of models looked utterly rubbish and I managed to spill paint on my bedroom carpet, leaving a large red stain all over the floor. The carpet had to be replaced with a cheap and thin one. I got a good telling off and told to put newspaper down in future! I abandoned the orange colour scheme, discovered methylated spirits and learned to scrub my lead figures with an old toothbrush. My next paint scheme was closer to Alaitoc, but with a variation. This looked much better. I came up with a name for my own Craftworld – Prathrannor. Over this time, I only played games with my close friends. I bought models for other armies too (see my later blogs), but there wasn’t a gaming shop in Andover and whilst I was part of (and ran) roleplaying clubs, I didn’t do much wargaming. One of the big problems was a lack of vehicles, the light armour and disparate nature of the rules. 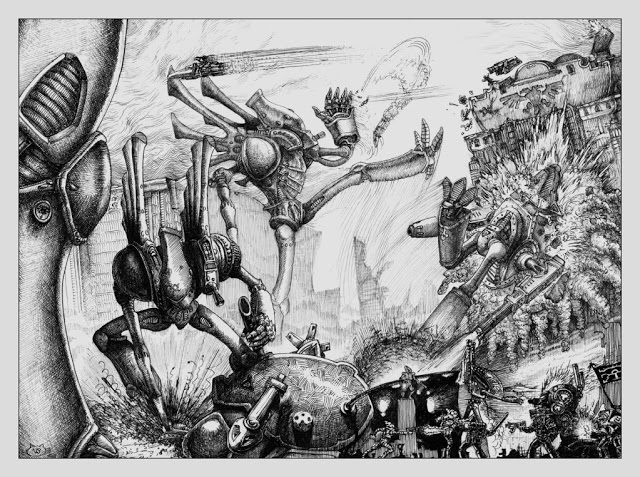 Eldar fared badly against Space Marines, but held up against Genestealers and Tyranids. Part of that may have been the quality of the generals, but the armies certainly weren’t balanced. Jervis Johnson’s continual losses in White Dwarf battle reports proved that! I bought a few extra models. The War Walker, the Spirit Walker, the Ghost Warrior and more. Most of them attracted a lot of bolter fire for being unusual. I even bought a Land Raider to convert as a transport. I don’t think I ever used it. University came along then afterwards I left home and lived in rented accommodation with my partner in Derby . My armies went into boxes for a while and I thought about other things. I returned to the hobby in 2002, when I discovered the third edition Eldar codex. There’s a good critique of the codex, here. The main thing that brought me back was the new Eldar Guardian plastics and the mention of transports – Wave Serpents. You could only get them by converting a Falcon Grav Tank with an upgrade kit from Forgeworld at the time, but that was a lot better than the vehicle choices we had previously (none). Plus, 2002 me had more disposable income that 1991 me. But more about all that later. Next, we’ll discuss the miniatures.”Allen Stroud is a university lecturer and Science Fiction and Fantasy Writer from Bedfordshire, England. He worked on the computer game Elite: Dangerous with David Braben and Frontier Developments as both a concept writer and official author, publishing Elite: Lave Revolution in 2014. He then worked with Julian Gollop and Snapshot Games on Chaos Reborn, devising the world of the game and publishing The Loremaster’s Guide and Dreams of Chaos in 2016. Allen is Editor of the British Fantasy Society Journal and Chair of Fantasycon 2017 and 2018. You can find his website here. 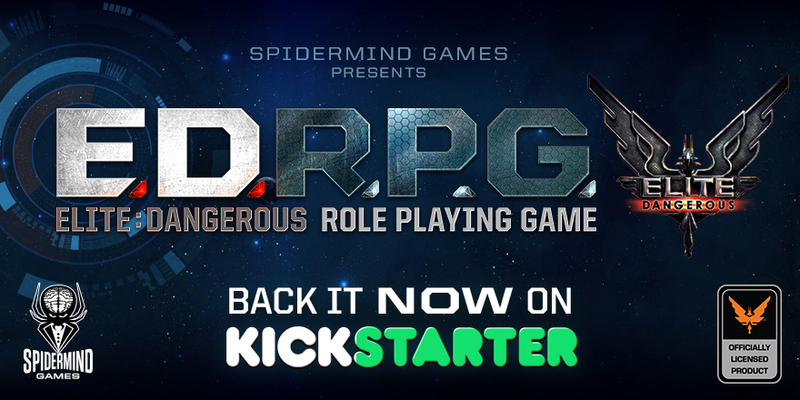 In 2017, Allen is returning to the Frontier/Elite Universe with EDRPG, the roleplaying game for Elite Dangerous. Find out more here.